TheLeonid meteor shower is back this month and poised tohit its peak next week. But there's a long history associated with theannualskywatching event. Itall began on the night of Nov. 12, 1833, when theWestern Hemisphere unexpectedly came under attack by a firestorm ofshootingstars that were reportedly silent, but overwhelming filled the sky. Followingthis realization, the meteors were given theLatin family name for their apparent place of origin: the Leonidmeteor shower. Thisspectacular 1833Leonid meteor storm made a deep and terrifying impression onthe Americanpeople. Accordingto newspaper reports almost everyone saw it,awakened either by the commotion in the streets or by the moving glareoffireballs shining into bedroom windows. Thispoint of emanation of the meteors (called the "radiant")was in the same place for all observers and remained so as the nightwore onand the sky turned. Here was proof that the meteors were travelingparallel toeach other from somewhere outside of our atmosphere. Upuntil only some years earlier, astronomers had refusedto believe that meteors ? those streaks of light so commonly seen inthe upperatmosphere ? could have any astronomical connection at all. Thisremarkable finding, that meteors are visitors fromastronomical realms, was striking in its own way as the shower itself.Itsparked intense study into this new field of astronomy. After1833, many astronomers researched the history ofthe Leonids in ancient European, Arab and Chinese documents. In 1837,theGerman physician and astronomer Heinrich Olbers suggested thatbetter-than-average displays occurred in cycles of 33 or 34 years. Otheraccounts subsequently came to light. In 1799,Alexander von Humboldt ? the great German naturalist and explorer ?watched astupendous display of brilliant fireballs during his explorations inVenezuela. "Therewas not a space in the heavens equal to twicethe moon?s diameter which was not filled every instant by shootingstars,"Humboldt wrote. Particularlyimpressive displays were found to have takenplace in the years of 1533, 1366, 1202, 1037, 967 and 934. Arabhistoricalaccounts have called the year of 902 A.D. the "Year of the Stars," asLeonid meteors lit up the night sky during which Ibrahim, king ofTunisia andSicily, lay dying. Afterastronomers began studying the Leonid meteor shower,they ultimately traced its origins to a so-called dense "knot" ofmatter that revolved around the sun in a period that, in 1866, wasdetermined at33.25 years. That same year, the likely source of meteor streams wasestablished by Italian astronomer Giovanni Schiaparelli: The Leonidscame from a comet. Schiaparelli'sLeonids origins discovery came after heestablished that the orbit of another famous shower ? the AugustPerseids ? closelymatched that of Periodic Comet Swift-Tuttle. In that same work,Schiaparellipublished his calculations for the orbit of the Leonid stream. Otherexperts in celestial mechanics noticed a strikingresemblance of the Leonid orbit to that of the newly discoveredPeriodic CometTempel-Tuttle. This relatively small comet is in an orbit that at itsclosestpoint to the sun almost coincides with the Earth?s orbit andalso movesthrough space in a direction opposite to Earth. Sowhen we meet its dusty trail in mid-November theseparticles collide with us at the maximum possible speed ? 45 miles (72kilometers) per second. From our perspective on Earth, the meteors comeat usfrom the direction of the constellation of Leo, the lion, which inmid-Novemberappears dead ahead of us in our path around the sun. Thismeans that we have to be on the forward side of the Earthto see them coming ? that is, we must be up during the hours betweenmidnight anddawn. Leonids tend to be quite bright and are tinged with green or bluebecauseof their great speeds. Abouthalf of the Leonids create bright, luminous trails ?in the most extreme cases, hanging in the air for eight or even 10minutes. Themeteors begin to flow when they are still nearly 100 miles (160 km)highbecause they, like the Orionid meteors of October, are thin flakes fromthenucleus of their parent comet. So the relationship becameclear: meteorstreams are the debris of crumbling comets. AfterSchiaparelli's 1866 discovery, the Leonid meteorstorms returned on schedule that same year and in 1867, though notnearly asabundant as what had been seen in 1833. The meteor rates reported inthoseyears were about to be 5,000 per hour from Europe in 1866, and about1,000 perhour from North America in 1867. Anothergreat shower was confidently expected for 1899and fairly wide publicity was given to the possibility of are-enactment of theevents of 1867 and especially 1833. Butinstead, the anticipated Leonids spectacular failedto materialize. It was later determined that their orbit had beensignificantlyperturbed by Jupiter ? as happens to most comets and meteors sooner orlater ?or perhaps, as some suggested, the meteors in the Leonid stream werebecomingmore evenly and thinly spread along their orbit. Theonce great Leonids had seemingly become just a minorstream. Even worse, Comet Tempel-Tuttle, the source of the meteordebris,failed to be seen both in 1899 and 1932 and was presumed to be lost. By1961, the Leonid meteor shower began to revive,unexpectedly reaching rates of up to 50 per hour. Then in 1965, CometTempel-Tuttle, lost for nearly a century, was at long lastrediscovered. Observersthat same year in Hawaii and Australiawitnessed Leonid rates of 120 per hour, many of these appearing asspectacularfireballs. Then one year later, on Nov. 17, 1966, a tremendous storm oftens ofthousands of Leonids fell for a short interval timed for skywatchers inthecentral and western United States. Therate was estimated by some as 40 per second! Thatworks out to 144,000 per hour. It was a veritable stormof Leonid meteors, the greatest meteor display ever seen atany rate inhistorical time. CometTempel-Tuttle swept through the inner solar systemonce again in early 1998. New studies using computer modeling indicatedthat itwas not a singular knot, but rather several dense trails of materialimbeddedwithin the Leonid stream that gave rise to spectacular meteorstorms. Aspectacular display of hundreds of fireball meteorsappeared in 1998. This was followed by meteor storms numbering in thethousandsper hour in 1999, 2001 and 2002. Morethan a decade has now passed since the comet?s mostrecent visit, and the Leonids are now producing far more modestdisplays. 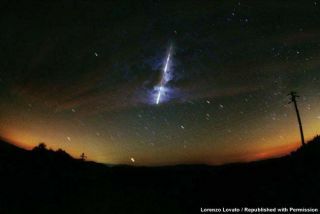 Attheir peak, perhaps a dozen or more meteors might be seen streakingfrom out ofthe Sickle of Leo. Itseems that we?ll have to wait until Tempel-Tuttlereturns to the vicinity of the inner solar system in 2031 for the nextgreatLeonid cycle. However,long-range orbital computations indicate that aclose encounter with Jupiter in 2028 is expected to once againseriouslyperturb both the comet's path and its accompanying dense trails ofmaterial,making storms of historic magnitude (meteor rates in the thousands perhour)unlikely for many decades to come. Aboutthe best we can hope for are Leonid displaysnumbering not in the thousands, but maybe only the hundreds per hourforseveral years beginning perhaps in the year 2033. The Leonids have thepotential to be quite impressive in those years ? a display of, say,500meteors per hour would be more meteors than most people would see in anentirelifetime. Butany hope of a repeat of the amazing spectacles of1799, 1833 or 1966 does not appear likely until sometime after thestart of the22nd century; something for our great-grandchildren to look forward to. JoeRao serves as an instructor and guestlecturer at New York's Hayden Planetarium. He writes about astronomyfor TheNew York Times and other publications, and he is also an on-camerameteorologist for News 12 Westchester, New York.